Military Science in Spring 2008? 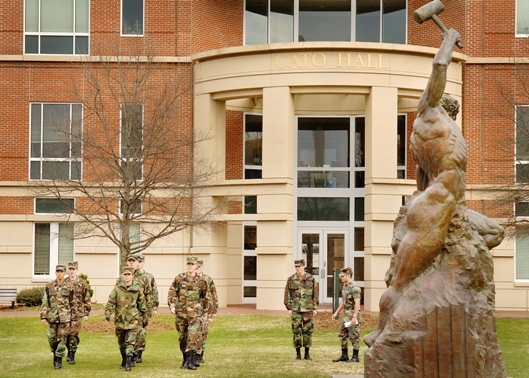 Today on campus I observed one of the military science lab courses (ROTC Cadets at drill/instructional practice) on the field in front of Cato Hall. I watched them for several minutes and analyzed their behavior, attempting to figure out what it is that intrigues me about military guys, and I found it… the pure precision of execution of movement, as well as their ability to still seem human while doing it. It is likely that because of the way my life is, I will not ever get a chance to have military experience. It is because of this that the Military Science/ROTC courses have always intrigued me. I believe that it would be very beneficial to me to take the introductory course, if for no other reason, just to get some leadership experience. September 20, 2007 CurtisComments are off for this post.